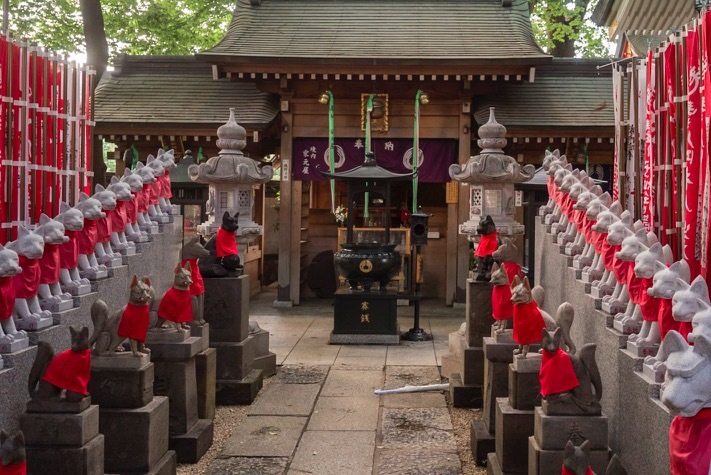 Tokyo is one of my favourite places to visit in Asia – and it is also very easy to visit with a baby. In fact, it is so easy (compared to Hong Kong) that we visited it twice within three months. 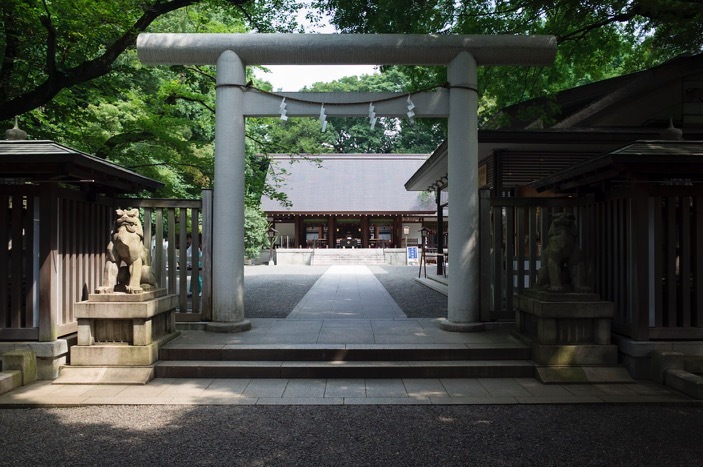 Let me post a little bit about the different places we visited over the next days and then summarise the series with a post about travelling with a baby in Tokyo. 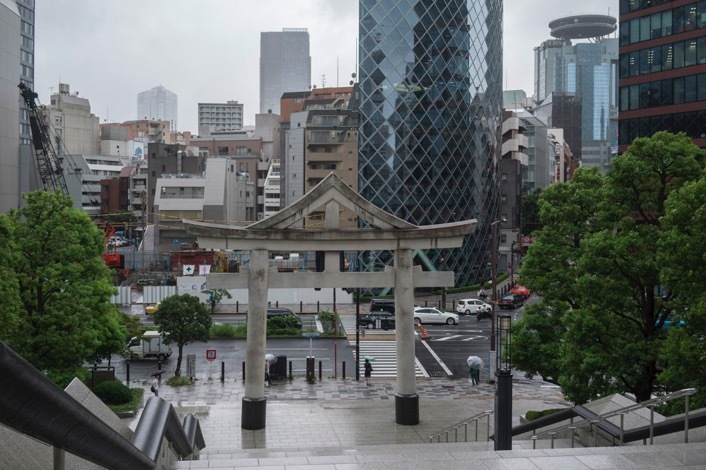 So for today, let’s start with Akasaka, as that’s the area we stayed in, when we visited back in July. This is one of Tokyo’s central business districts, full of offices, but also plenty of restaurants and cafes. There were so many options to choose from, we were spoilt for lunch and dinner options! Anyway, we started visiting the Hie Shrine. 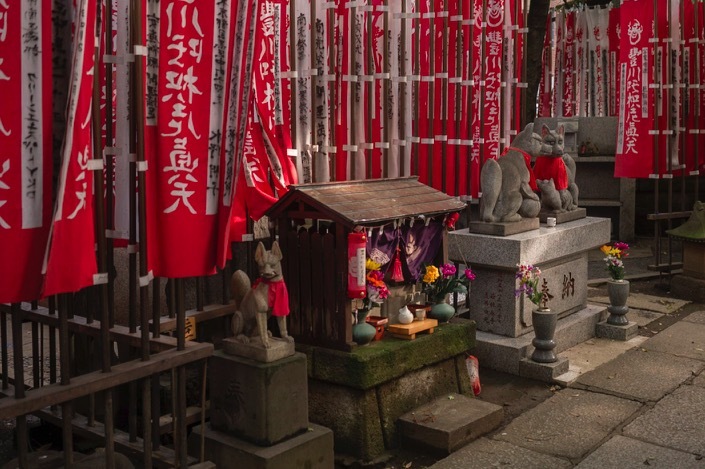 This is probably the most urban shrine, as it has an escalator at its entrance! 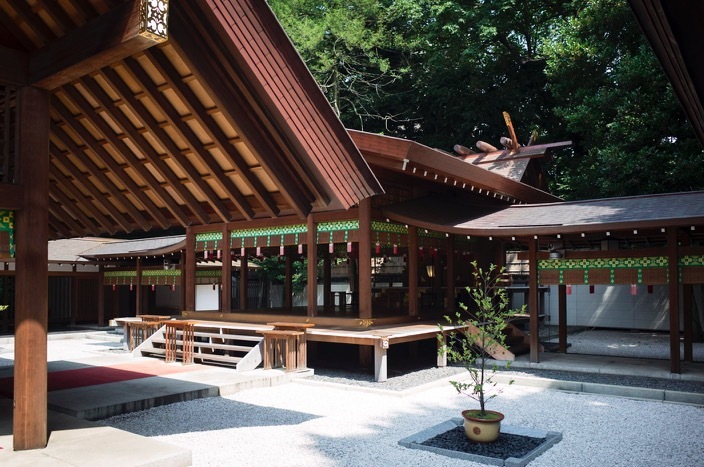 It used to be an old shrine from 830, but since then it has moved several times and had to be reconstructed after World War II. 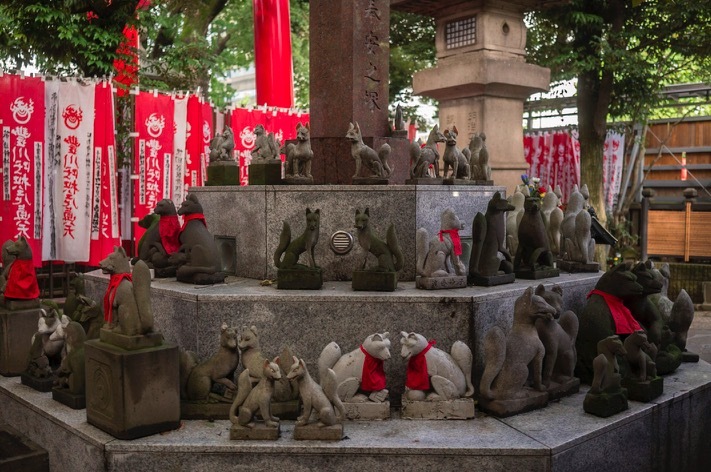 What makes this shrine special is the Sanno-Sai festival, that takes place every June. 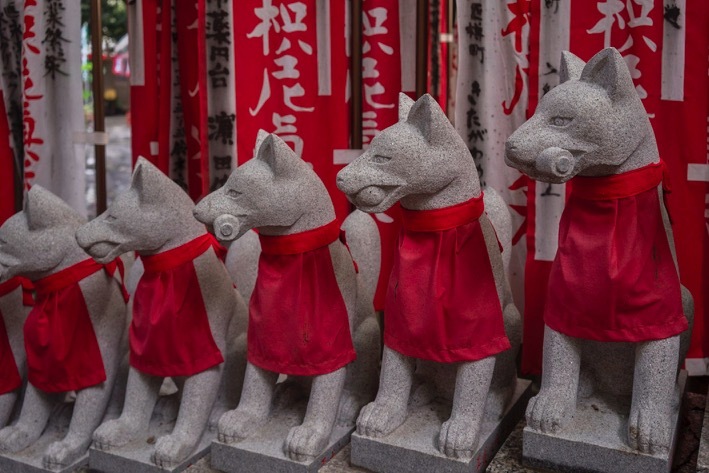 It is celebrated with a grand procession of 50 portable shrines and people in Heian-era costumes. 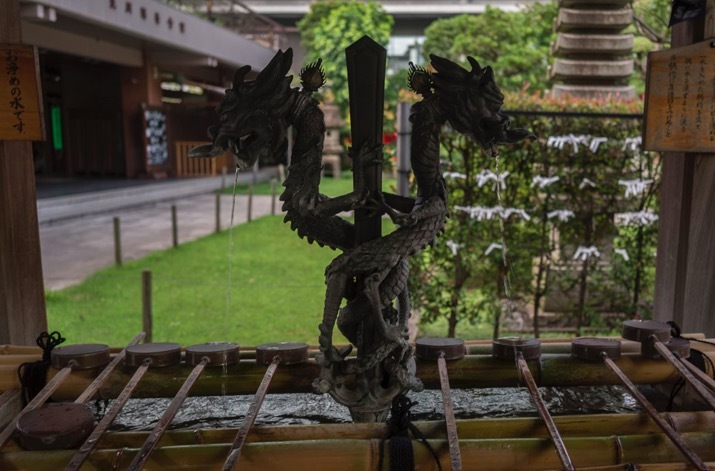 We had missed the festival by a few weeks, so when we visited the temple, it was quiet (it was a rainy Thursday afternoon, so no wonder hardly any people were around). 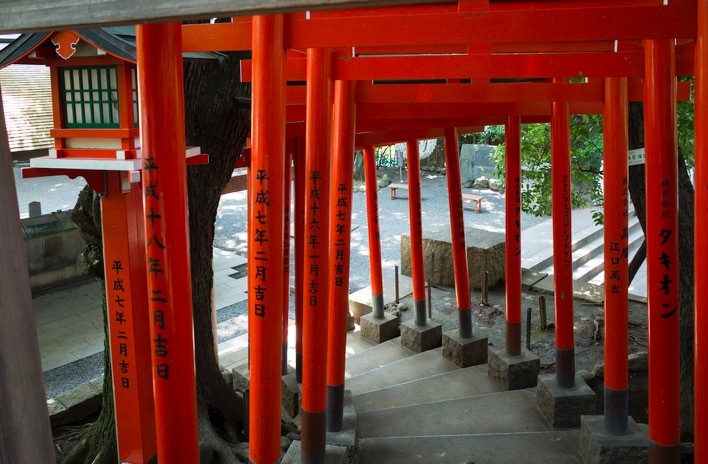 What I enjoyed most were the red Torii wooden gateways, which mark the boundary of the sacred precincts. 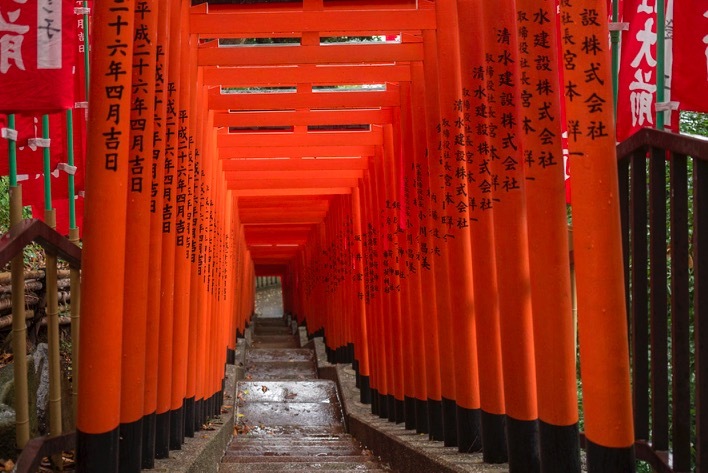 Of course, they don’t compare to the amazing Fushimi Inari Shrine in Kyoto, but they are still beautiful to look at, don’t you think? 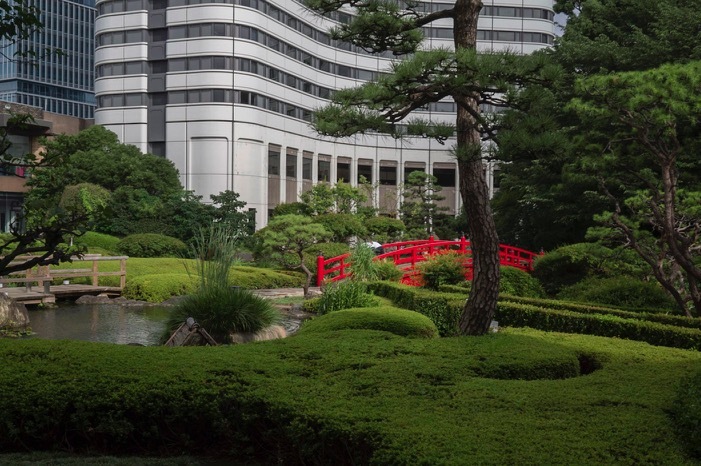 A few steps North from the shrine is the Hotel New Otani. 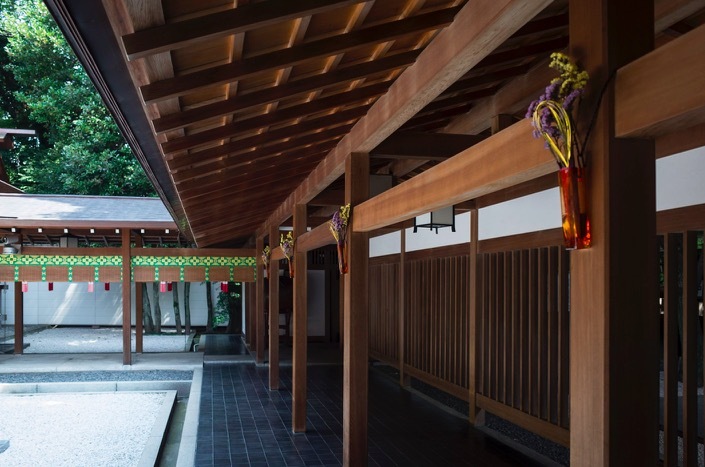 It is one of the famous hotels of Tokyo, but we did not visit to see it rooms – instead, we went there to walk in the famous garden. 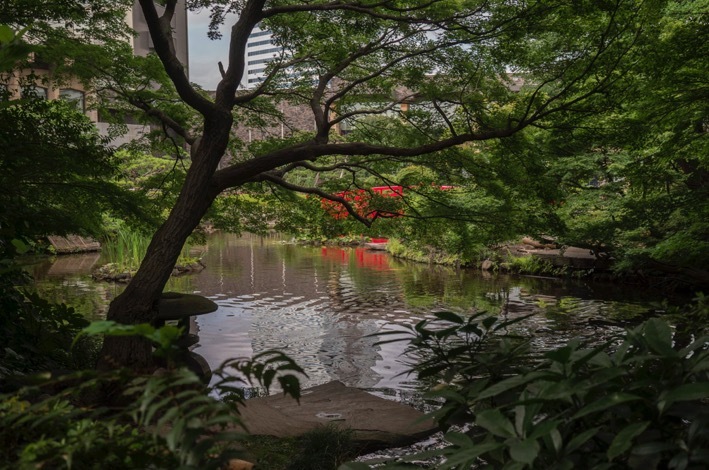 The Japanese Garden at Hotel New Otani Tokyo dates back over 400 years. 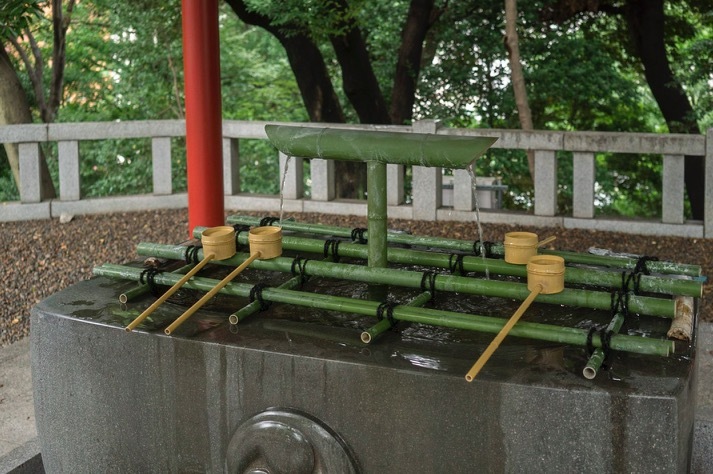 It used to belong to a famous samurai lord (Kato Kiyomasa) and it features a beautiful scarlet-coloured Taikobashi Bridge across a pond, several fossils and red coloured Akadama stones, lanterns, pagoda and a waterfall. 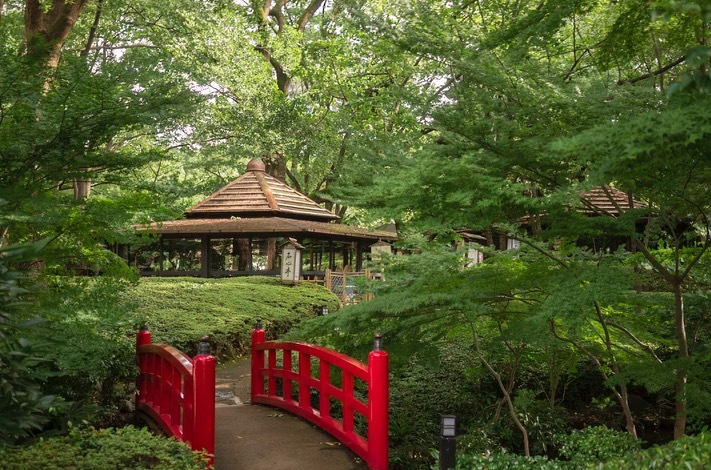 You are in for a relaxing, charming treat if you stroll around the garden, which is just minutes away from the busy life in Akasaka. 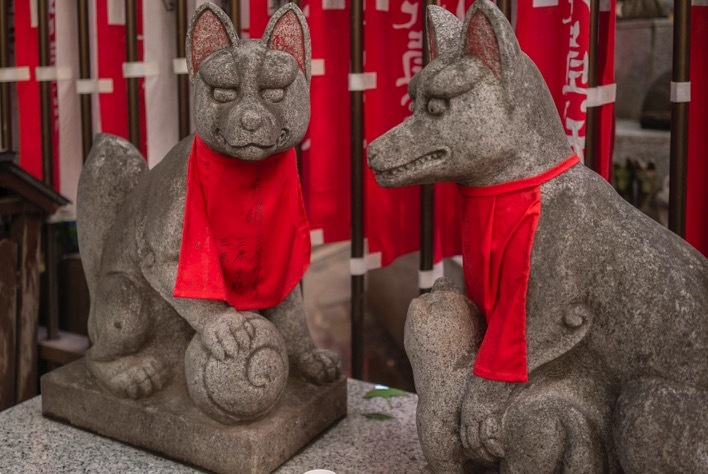 Upon leaving the park, we walked a little towards the South-West until we reached the Toyokawa Inari Shrine.The temple is distinctive for two reasons: (1) There are thousands of red banners fluttering for the health, wealth and safety of petitioners and (2) hundreds of fox statues, mostly in stone, and in different shapes, sizes, postures, expressions, and degrees of wear and tear, that decorate the grounds. 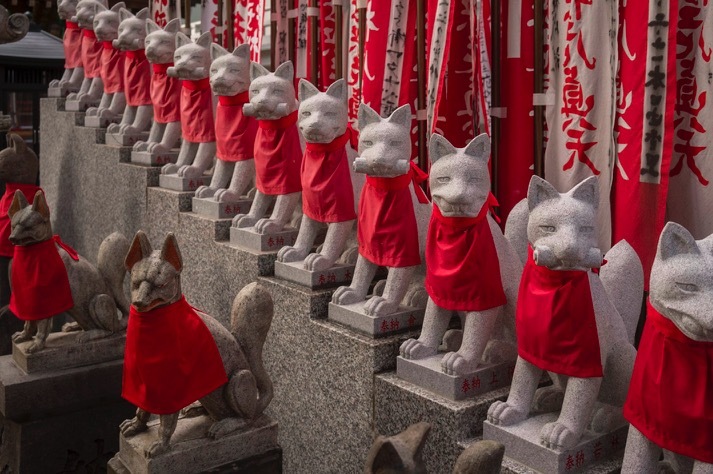 The foxes are the messengers of Inari, a Shinto Rice deity. 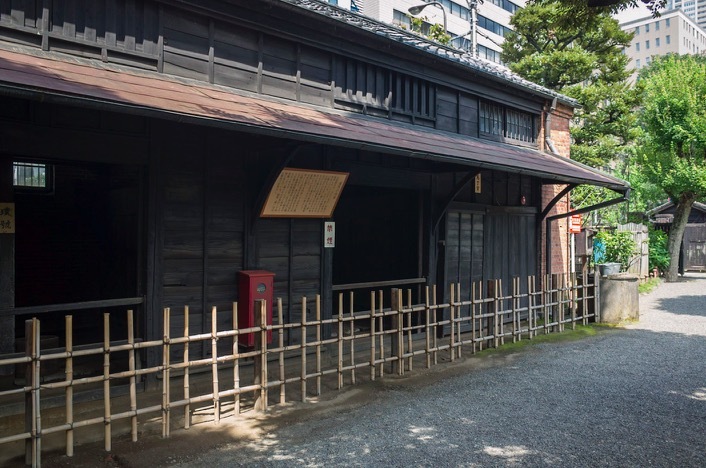 We continued walking towards the West for 20-25 minutes, before we turned South to reach the Nogi Shrine. This is very close to Tokyo Midtown and the Roppongi Area. It was our final stop for the day. 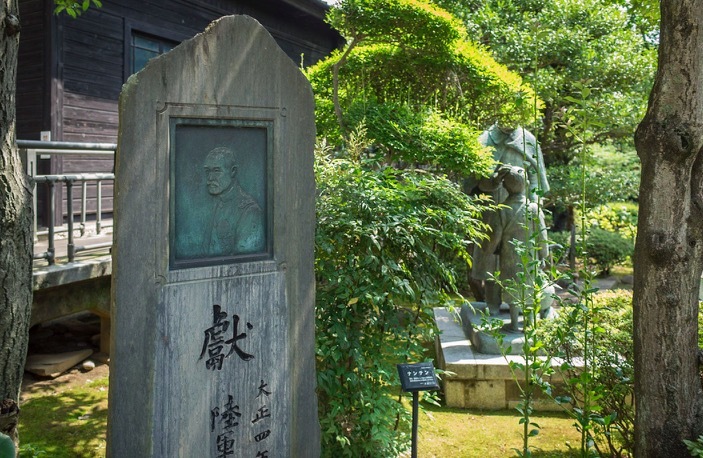 The shrine is dedicated to General Nogi Maresuke and his wife Nogi Shizuko, who chose to kill themselves after the Meiji Emperor’s death. 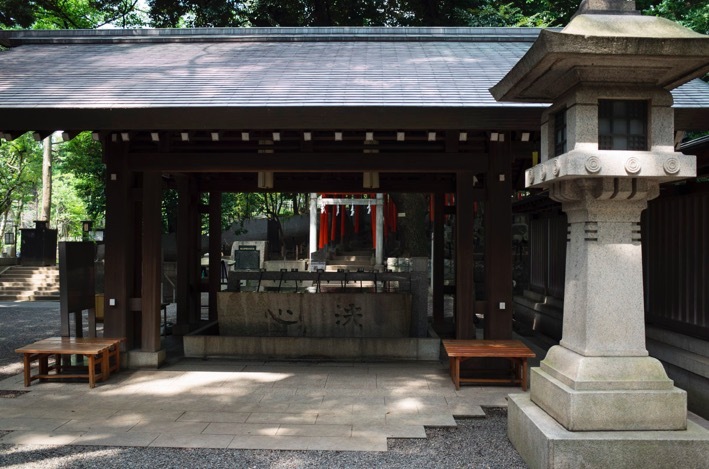 In honour of their many sacrifices a shrine was dedicated in 1923, next to their home and stables. 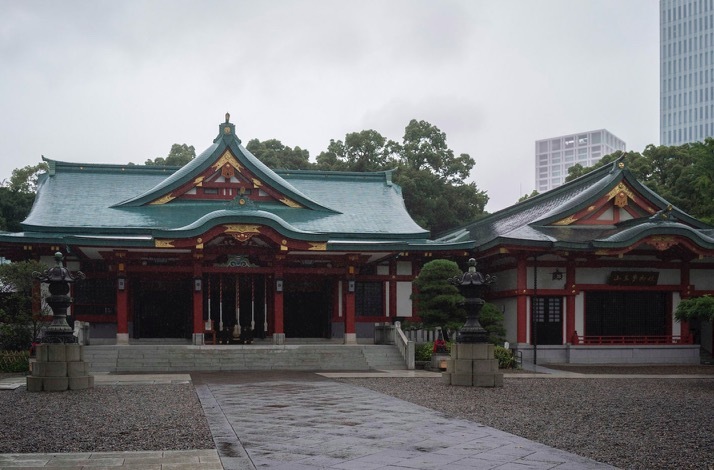 The shrine burnt down in the bombing raids of 1945 but was rebuilt again in 1957 – and I’ve been told it is now a popular wedding destination, but when we went, it was calm and quiet – like much of the sites we visited in Akasaka. 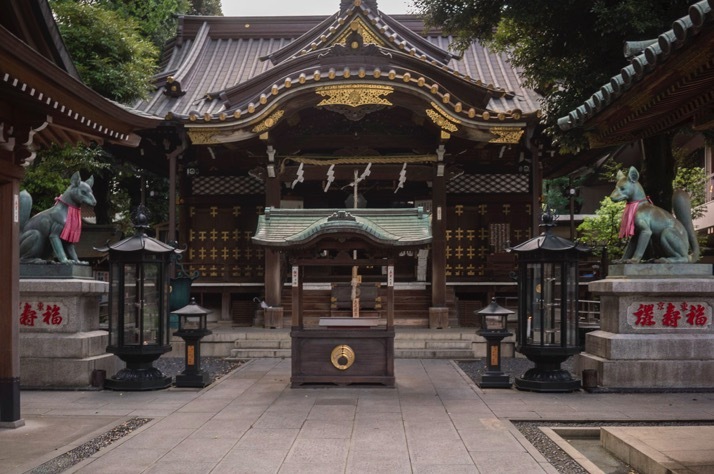 It is easy to forget how crowded and busy Tokyo can be, if you stroll around the shrines, temples and parks of Akasaka.